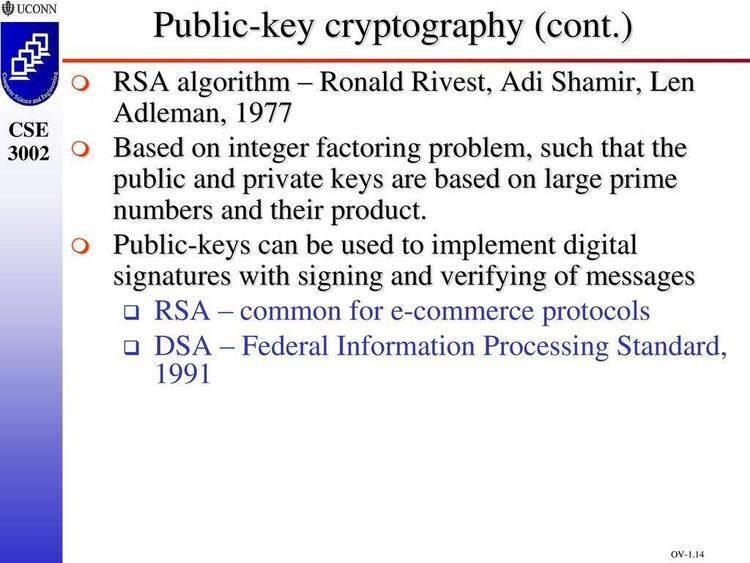 RSA is an implementation for IBM-compatible microcomputers of the Rivest-Shamir-Adleman public-key cryptographic system. the program is not distributed without the documentation. purpose for the program or documentation. sound and on-line time estimates for long-running operations. display format that should work on any MS DOS machine. only known secure public-key cryptosystem. viability of the system was not the source of the controversy. be the only way to "crack" the RSA system. agreed upon beforehand by the interested parties. still insufficient to deduce the corresponding decoding key. to find a pair of large prime numbers (a decoding key). well ahead of current technology and mathematical research. of public-key cryptography. This is what RSA.EXE, in fact, does. digital signature feature of the RSA cryptosystem. implementation plus private-key system by Craig Hessel. LIAL interpreter (V.
88.07.27) handles core routines. Frills written with Don Fordham's EZWINDOWs. See file RSA.DOC for complete system documentation. discussion), but it is fastest for learning to use the program. keys with their descriptive tags. is thus suitable for input redirection. others with whom you wish to exchange RSA-encrypted data. DKEY.RSA file on a floppy disk. their DOS file size. The same holds true for encoded data files. descriptive tags for the keys or files. RSA.EXE into some directory included in your DOS search path. (or will be created) in the current directory on floppy drive A.
this in a batch file. The options are discussed in the following sections. of the left cursor, which the program treats as a backspace. You may abort the operation by leaving either key tag blank. the ending time will also be displayed. program. Fortunately, it should not have to be executed often. physical security has been compromised. Times section for statistical data on key generation times. will send the encoded file. key in EKEY.RSA will remain unchanged, however. discussed in the Digital Signature section. specifications. Up to 40 characters may be entered in each case. source file. See the Overview section for a discussion of this. keys vary somewhat, since the operation includes a prime search. See the Operation Times section for detailed timing data. whom you received the encoded file. insure that the two keys are not from the same key pair. Signature section for more on this. descriptive tag with the DOS TYPE command. displayed. The messages displayed are "Decoding private key..."
possibility of extracting the DKEY from a 48-byte EKEY is remote. extracting the DKEY from an EKEY shrinks dramatically. length with the algorithms used by RSA.EXE. (S=8) be used for high security operations. contained in DKEY.RSA and/or EKEY.RSA. are prompted to enter a new description. your machine's speed subsequent to the check. time, and should fall below that range about as often as above. actual time may occasionally be a multiple of the displayed time. A beep will signal the conclusion of long-running operations. Error conditions will also be signaled with a beep. return key when prompted to enter a new description. empty file is created and a message to that effect appears. these keyracks are not distinguishable by the program. The keyrack is limited to 100 keys. This is an arbitrary limit. The extract option does not also delete the key from the keyrack. The program will prevent you from blanking out a key tag. This frills option allows you to enter a DOS-executable command. running. Typically, this will about 30 K.
the DOS prompt with the EXIT command. an error message when trying to create the corresponding files. error message when trying to create any such files. file specifications for the *.RSA files. other program, for that matter. using keys from the same key pair, restores the original data. Whether or not this is practical, or even feasible, is debatable. guarding their secret decoding keys. for the private-key system. Reading this section is optional. into RSA.EXE to execute the routines. for prime numbers. Both use a surprising algorithm, due to M.
1. P is 13-MU bits larger than half the system key size. 2. Q is 11-MU bits smaller than half the system key size. 3. P and Q each begin 100000... (binary). 4. Neither P-1 nor Q-1 is divisible evenly by 3. 5. P-1 and Q-1 each have a large prime factor. bit long. See the package LIAL2.ARC for further details. from the EKEY by just restoring the discarded leading set bit. than N bytes. The encoding algorithm here is deceptively simple. remainder from a division by the publically known encoding key. transformation is repeated until the result fits into N bytes. speed, not the intermediate computation of POWER. in N/4-byte blocks. Let P, E, D, and R represent the four parts. redetermined. This is repeated until D fits into N/4 bytes. decoding multiplier. Finally, part R is set to N/4 random bytes. part of the encoding/decoding process. fit into N/4 bytes, the transformation is repeated until it does. prime P barely exceeds N/4 bytes in length. (4*R+1)*(R+1). X is then exclusive-ored with the new R.
clear bits that follow the leading implied set bit in prime P.
its original zero value is restored. called the same routines as used in RSA.EXE. above have a rating of about 70 with the program's method. may be used with either version of the program. negligible amount for key sizes of 64 bytes or more. version of RSA.EXE are the same as those used previously. for testing took just under one second. machine at frill level 1. WANGs. You will have to use frill level 1 in these cases. eliminating TSRs to see if one is the cause of the problem.